When those temperatures start climbing during the summer months and you need some immediate relief from the oppressive humidity, there’s nothing more satisfying than biting into an icy dessert. So, if you can’t get enough of a waffle cone filled with swirly vanilla custard, don’t waste another moment in finding your next chilled-out confection! To help you locate your nearest summertime sanctuary that’s ready to scoop out the goods, we’re here with our guide to the Best Cool Treats to Beat the Heat near Richmond, MI. That way, you’ll bring down your body’s temperature and enjoy those steamy months better than ever before. In the middle of a hot, summer day when you can see the steam rising from the pavement, opt for something that’ll cool you down without weighing you down. 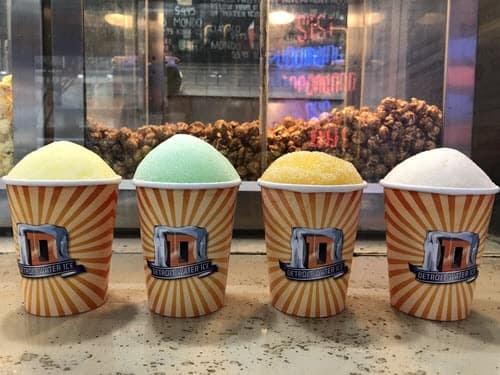 And at Detroit Water Ice Factory, they’ve got the recipe to quell your sweet tooth in the form of water ice. Got a hankering for something tropical? Well, look no further than their Cobo Coconut water ice that may just have you thinking that you’re lounging on the beach of an island oasis. If you’re craving the rich essences of ice cream without all the calories, try their Mr. Mitch’s Chocolate Peanut Butter. This chilled dessert combines your two favorite things for a creation that’ll “wow” your taste buds. But, don’t forget about this destination’s other mouthwatering delights, like their Fantastically Frozen Hot Chocolate. With one sip of this unique drink, you’ll be hooked to this summer-version of that famous chocolate elixir. Take a look at their popcorn by heading to their Facebook profile! Sometimes, you need a one-way ticket to a fully indulgent experience. So, when that sweet tooth starts screaming, surprise it with the more scientific take on ice cream at Milkster. By speed-freezing these polar parfaits with liquid nitrogen, you’ll deliver a bite of heavenly dessert into your mouth that’s been whipped up in a truly remarkable way. On top of that, this creative creamery strives to stay close to its roots by sourcing each ingredient from local shops and farmers. Thanks to their commitment, you can feel satisfied that you’re doing your part to help your community, while also getting yourself a hefty dose of rich, heavenly sweetness. Of course, we can’t bypass this parlor’s flavor mashups. Some of the frosty confections you’ll spot on their menu include things like Biscoff Voyage, where Cream, Decaf Coffee, and Cookie Butter join forces to battle your most vicious sugar cravings. And, if you’re more of a traditionalist, savor the simple flavors of their Madagascar Vanilla Beans, which dots local Michigan cream with authentic Madagascar Vanilla Bean. Check their Facebook for some of their special and seasonal flavors! Let’s face it, there’s nothing quite like the combination of soft cake and velvety ice cream. That’s why Treat Dreams serves up their homemade ice cream cakes which feature their weekly rotating selection of creations. So, whether you want to carve up slices of this creamy cake at a birthday party (or just eat it all yourself…) you’ll enjoy every morsel of this frozen indulgence. 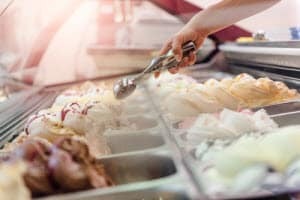 In addition to their imaginative ice cream flavors, this sweet eatery makes sure that you top your treat with something truly magical by churning out their homemade sauces, like a Vanilla Java Porter Chocolate Sauce, a Vanilla Brown Butter Sauce, and more. To snag your most beloved concoction, even if you’re in a rush, stop by their shop and grab a pint of their frozen desserts. That way, you can cozy up with a pint and a spoon while you binge on the newest Netflix series. Visit their Facebook page, so you don’t miss out on a single scoop!